This is a picture of what I told you about. I just want to add my encouragement to Claudia's that you take her to the vet. 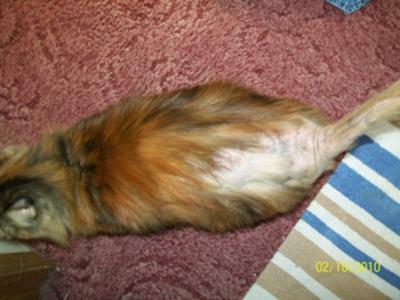 This loss of fur is definitely an indication of something physically wrong. It may be an allergy or it might be a problem like thyroid that can be treated very easily with a pill. I hope you have taken her to be checked by now as I notice your entry was sent several months ago. If you have any updates I would love to hear how she is now, in late 2010. As per your request, I'm posting Caly's picture and info so that maybe the readers can give you additional information on the condition of your daughter's cat. However, I recommend that you take her to the vet immediately. It could be something serious. Most likely, her losing her fur is a symptom of an illness. Please let me know if there are any changes with Caly. And again, please take her to the vet.